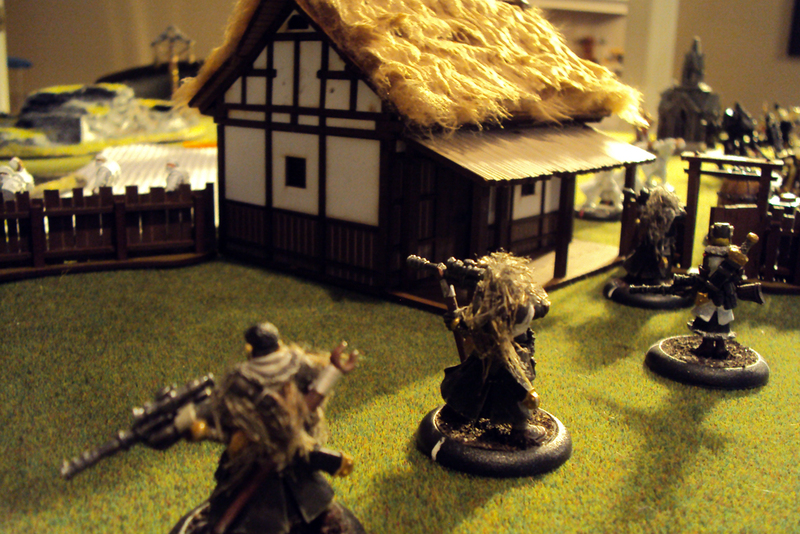 While Nick was happily smashing druids with his dwarven axes (Dwarven crafts! Fine dwarven crafts, straight from Orzamar! 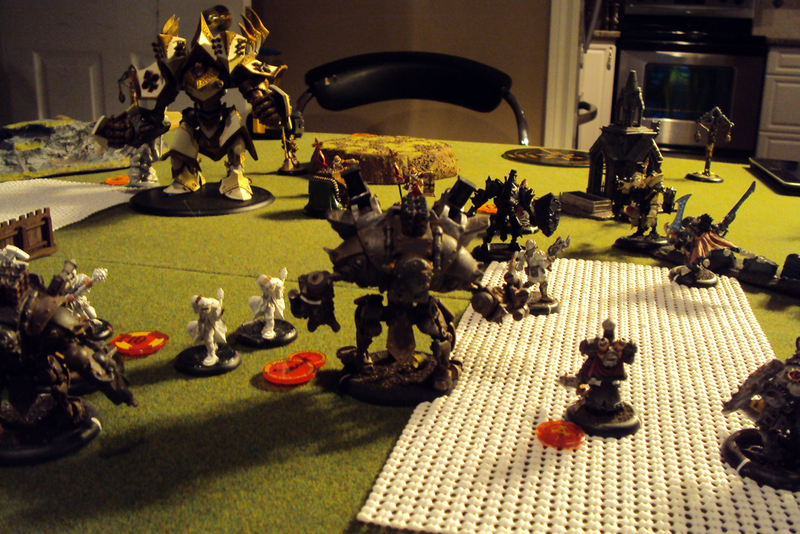 ), Aaron and I were free to indulge in a little light WarMachining of our own. Now, I say “light”, but the 2 lists that Aaron brought to the table… okay, let me back up a second. Every week, our group (of now 8 players) has randomly assigned matches. Before we show up, we have no idea who we will be playing, to encourage us to bring more “all-comers” sorts of lists (and to get more tournament-style practice in). 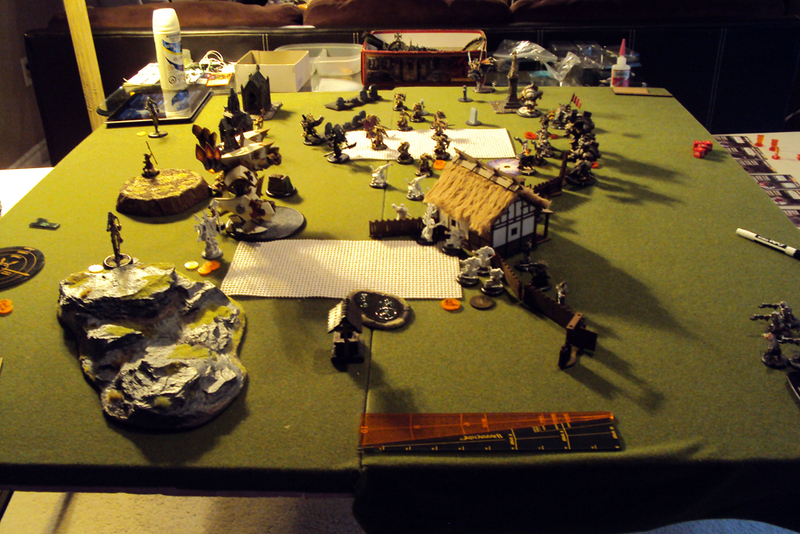 Aaron’s two lists, and I kid you not, were titled in his War Room as “Strakhov 50pts” and “Anti-Menoth List”. So a lot of warjacks in this list, which is still unsurprising considering how few points of infantry I actually have painted… and plus I love my Menite warjacks. I really do. Anyway! A few proxies, for which I apologize, but nothing too jarring I hope: the part of pSeverius in this battle was played by eSeverius (who I’ve noticed has switched hands… his staff used to be in his right, now in his left! ), Blessing of Vengeance is being understudied by a Revenger, and that’s it. See? Not too bad. 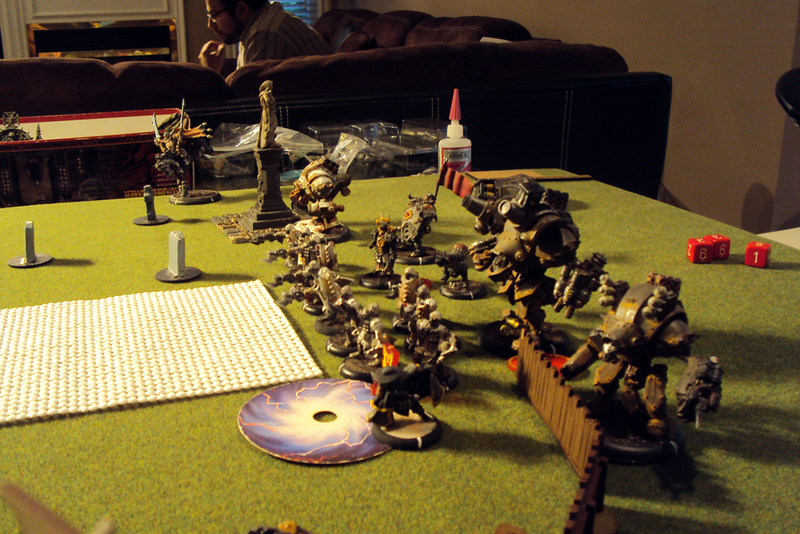 It doesn’t look like a lot… heck, it’s NOT a lot… but that’s 34 points worth of warjack right there. The Assault Kommandos… well, against Menoth they’re not bad (their immunity to fire is certainly a kick in the crotch… which I *just* realized I forgot about at one point… damn… one of these days we’ll play without cheating! ), but they struggle to hit things. At least pIrusk’s Feat will help them with that, and Battle Lust is fantastic on a unit with 2 melee attacks… but… well, let’s just say I’m unconvinced that this is a good list. 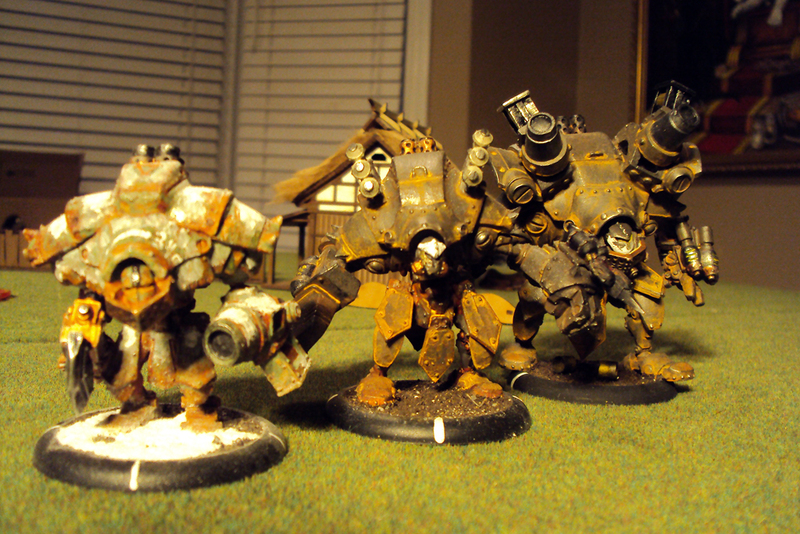 I feel Aaron’s pain, though… I love putting my big stompy robots on the table (hence why my list has 3 of them! One of those a colossus, no less! ), and Irusk, in theory, should be able to run 2 warjacks about as well as anyone else in Khador (which is a little sad). But I digress. It’s an interesting list, and I think it probably gets brownie points for being unique! The scenario we rolled was “Two Fronts”: Two 6×12″ zones, one enemy and one friendly, offset from the center line, and two objectives (again, one friendly one enemy). The objectives grant “Fuel” (free charges) when not contested, and have the attribute “Priority” (you can’t dominate a zone if the enemy objective is in your CTRL range). 1CP for destroying the enemy objective, dominating your own zone, on controlling the enemy zone, and 2CP for dominating the enemy zone. In theory, it’s possible to score 3CP in a single turn (either dominate your zone while controlling the enemy zone or dominate the enemy zone, and then destroy the Objective), but overall I still like the scenario. Pressure without being overwhelming or ignorable. We rolled for initiative, which I won and elected to go first (as I almost always do). Aaron picked the more open side of the table (with a healthy sprinkling of concealment for his Widowmakers) and I started to set up! My Judicator (“Dread of the True Law”) went smack in the middle of my deployment zone with the Vassal, as I am wont to do. The Zealots went right up next to her to the right, while Severius, the Hierophant, the Choir, and Blessing of Vengeance went in the middle. The Redeemer went to the right flank. Eventually, the Wracks went with 2 of them to the left and 1 to the right (after seeing Aaron’s deployment, I decided I needed more firepower on that side of the table, which it turns out… was probably a mistake…), and my Errants went in front of Sevy and the Redeemer on the left as well. Aaron deployed in a solid brick: front line of Assault Kommandos, with Behemoth literally TOWERING over them (Aaron’s custom Behemoth is a thing of beauty, but it really makes everything else look tiny… which is actually awesome), Torch to the middle, and Gorman nearby. Irusk went behind the AKs, the Destroyer and his Man o’ War Kovnik went to the left flank, and the lone unit of Widowmakers took to the field on the right in order to make me fight for my zone (or alternatively to control it if I abandoned it to focus firepower on his block of troops). Lastly, Fenris goes out far on the left side. With that, we were ready to rumble! Before Aaron says it, let me apologize for the lighting… we do the best we can with the tools we have, but this table we’re using is somewhat unforgiving with it’s light sources. We even tried placing some clamp-on lamps, but they sadly were not a help… anyway, I still like ’em (I think the pictures make it look like we’re fighting at dawn! ), but if your delicate sensibilities are offended, I apologize profusely and hope all is mended. 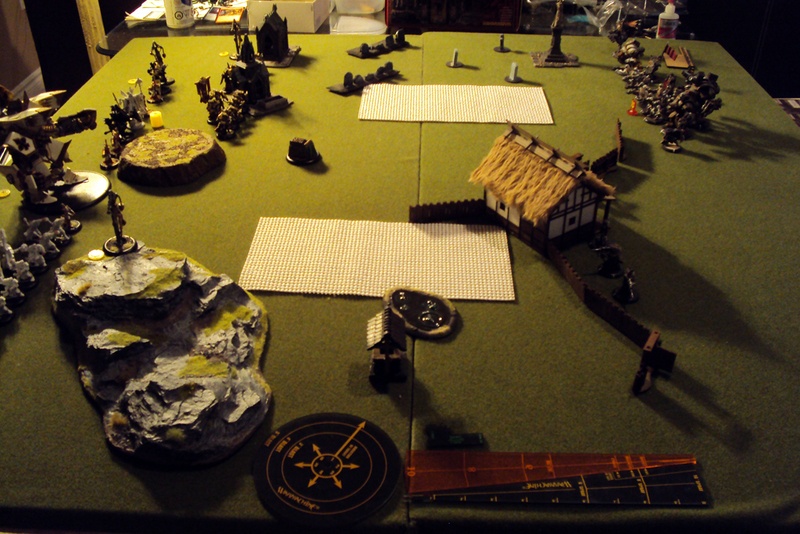 And no more rhyming this battle report. Anyhoo! Judicator Dread automagically generates 1 Focus, Severius allocates 1 to both of my lights, and we’re off. The Choir goes first, shuffling around a bit and singing “No Shooting” on my warjacks. I figured it was unlikely, but hey, better safe. Judicator Dread runs forward up the middle of the table. 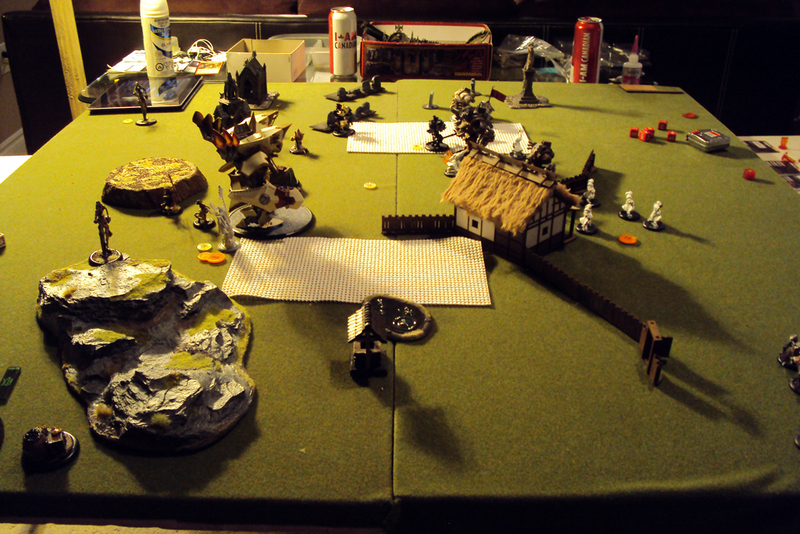 My Vassal of Menoth activates next, walks up behind the big girl, and gives her an Ancillary Attack, which launches a rocket directly at Irusk. Sadly, the scatters both go harmlessly away from his troops… such is life. 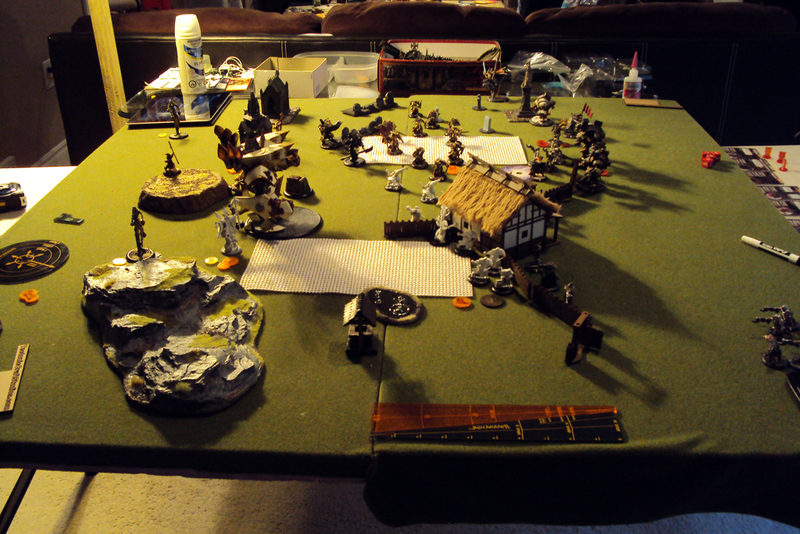 Sevy gets Harmoniously Exalted and then activates, moving up onto the hill to better oversee the coming carnage. He casts “Defender’s Ward” on the Errants (love me my 14/18 Errants! ), Eye of Menoth on himself, “Vision” on Blessing, and camps any that were left. The Zealots, thus… motivated?… run forward into my friendly zone and spread out. The Errants run forward and spread out as well. 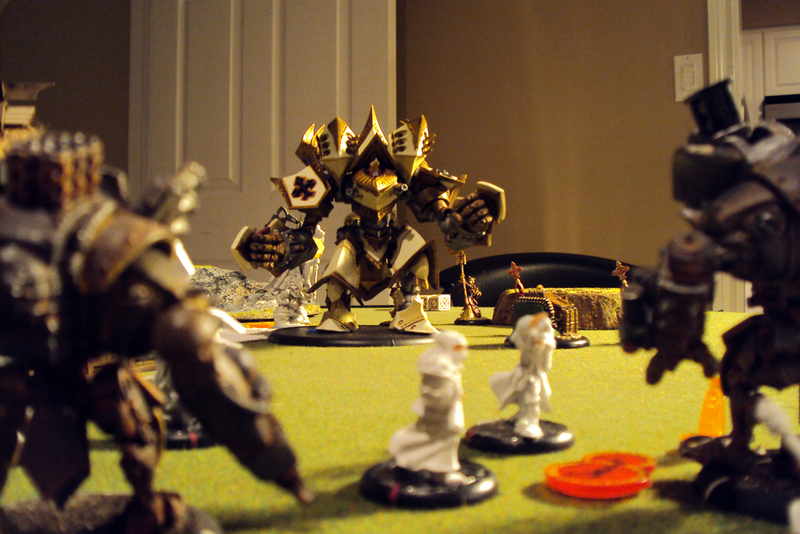 The Redeemer runs up behind them, and Blessing heads up the middle of the table a little more cautiously. So the start of the bottom of Turn 1 and my Judicator has failed to kill anything yet. I’m as disappointed as all of you must be. But still, through the fire and the flames we carry on. Aaron forgets to allocate Focus. It happens to the best of us. I offered to let him do it anyway, but he sticks to his guns (and is a better man than I for it). 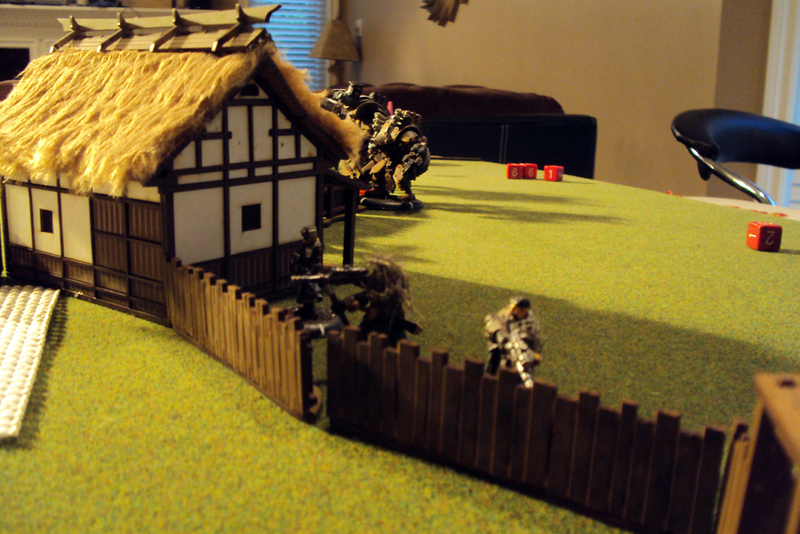 The Assault Kommandos move up in Shield Wall and open fire on my Errants. A few lob choking smoke grenades, but none of them find purchase against my high-DEF troops. Okay, look, can we talk straight for a moment here? I know AKs are maligned, but most of the reason I can see is because of these stupid grenades. 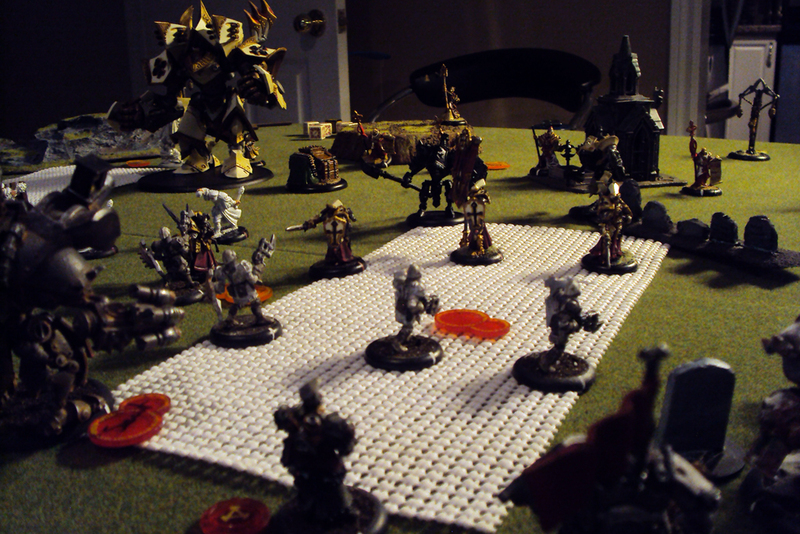 Why in Menoth’s great robes are you not allowed to use those AND the Carbines? The odds of hitting are so astronomically low, and if you miss they do nothing… it just boggles the mind that they can’t. But I digress. A few others of the AKs fire actual bullets at my Errants, and one manages to hit but fails to kill. Fenris moves up behind a gravestone for cover and looks threatening. The Kovnik rolls for his Drive and succeeds, giving the Destroyer boosted attack rolls. The Destroyer than moves up and takes a shot at an Errant, hitting and vapourizing the poor sod, but failing to kill any of his 2 brethren hit by the blast. The Widowmakers activate and move up to the fence. They open fire on the Zealots, needing 4s to hit. Fourth shot: HIts! One Zealot dies. You know, this same thing happened against Todd last week (you can see it here if you’re curious)… to be honest, I could get used to it. Anyway, Irusk activates. He casts “Inhospitable Ground”, puts “Superiority” on the Behemoth, and moves up. The war dog follows along obediently. The Behemoth trundles forward and elects not to fire. Torch likewise moves up and looks menacing but does nothing else. Lastly, Gorman moves up and drops a smoke cloud at his feet, catching one of the AKs. With that, Aaron is done his turn! Well, that certainly could’ve gone worse! Sevy upkeeps all 3 spells, allocates 3 to the Redeemer and 2 to the Judicator, and we’re off. 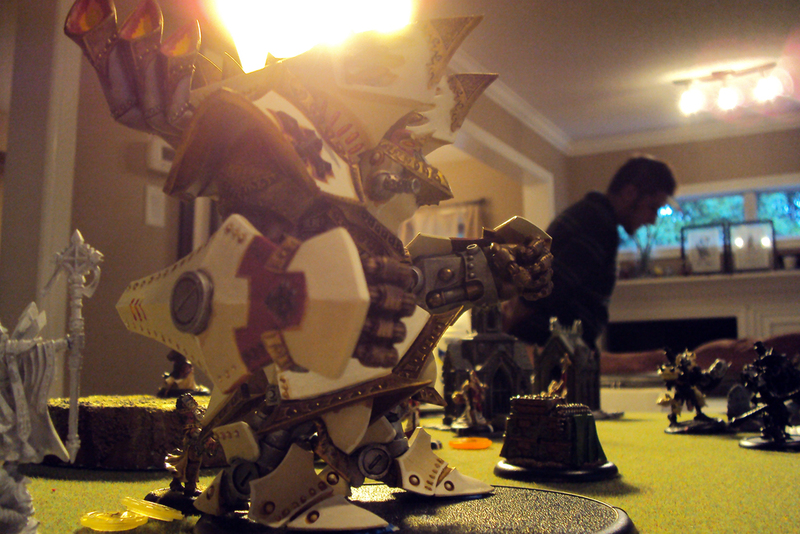 The Redeemer activates next and walks forward (begrudgingly, but I was pretty sure there was nothing within 16″). It opens fire on the AKs, hitting one directly and pulverizing him (POW15 on direct hits!) but failing to kill his brothers next to him. It does, however, also clip Irusk, who I boost against and inflict a few points of damage against. Next rocket streaks into another pack of AKs, killing the directly hit one again and one other. Last rocket sadly misses, and then scatters directly onto the war dog, and at dice – 5, fries the pooch… and Aaron fails the Tough roll. The Judicator goes next. She moves forward towards my friendly zone and launches two volleys of rockets: the first goes towards the Widowmakers but scatters too deep (10″ past my target! Where were those rolls LAST turn! 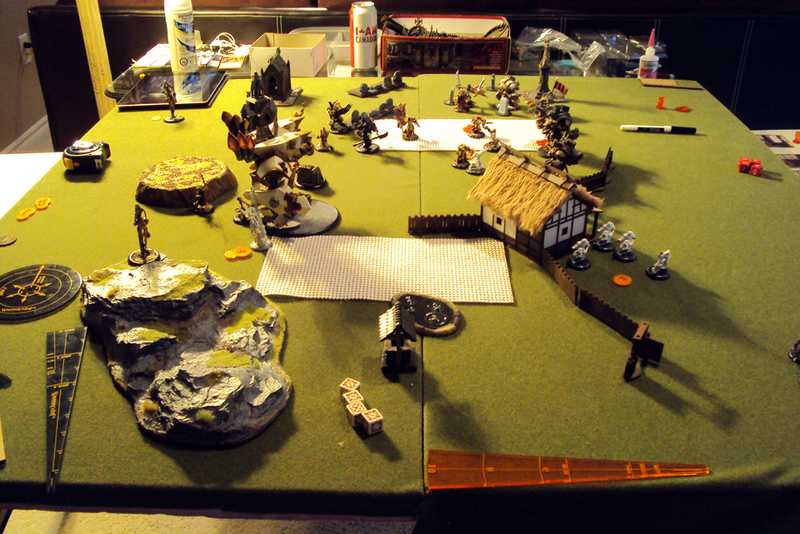 ), and the other rocket streaks towards Gorman but scatters onto Behemoth (I boost the damage but only inflict 2). The secondary explosion kills another few AKs. The Vassal activates and gives Judicator Dread another chance to kill Gorman, but sadly this shot also fails to catch him, scattering towards the Widowmakers but failing to catch any. With the inaccurate long-range firepower dealt with, it’s time to activate everything else. The Zealots pop their mini-Feat, pray for No Spells, and run forward. I send half (more or less) towards the Widowmakers, while the other half curl towards the middle of the table. A few of them have their runs truncated slightly by Irusk’s “Inhospitable Ground”, but only by about 0.5″. The Errants activate, walk forward and spread out. 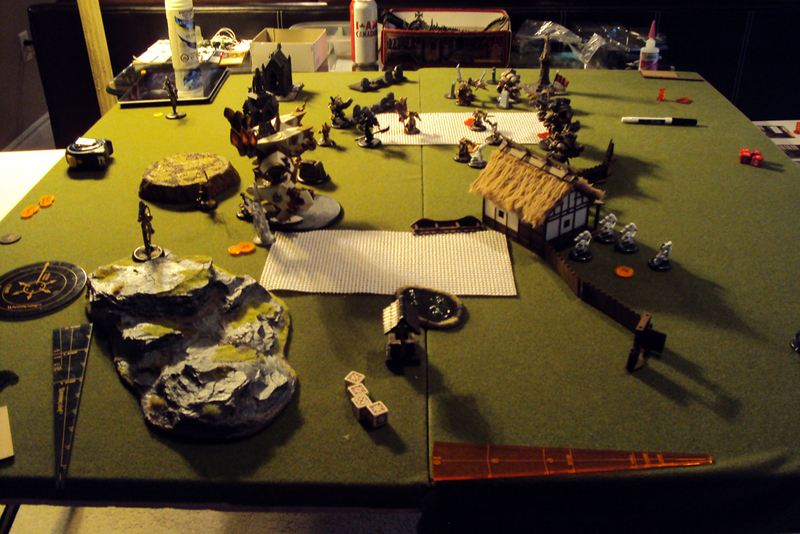 I fire 2 crossbow bolts towards Fenris, both of which hit but only one penetrates ARM, inflicting a few points, and the rest of the shots go flying into AKs… Aaron is down to only 4 remaining at this point. 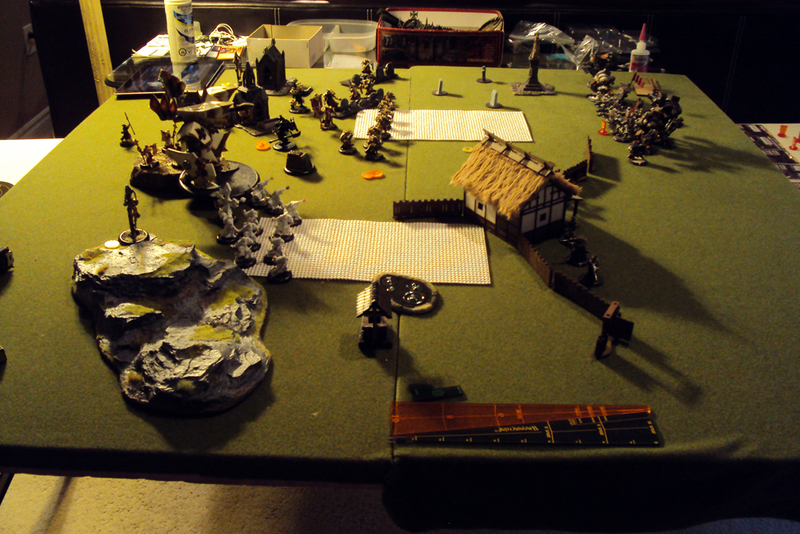 Despite wanting to keep Sevy in the fight (well, keeping the “Eye of Menoth” in the fight, more accurately), I realize that I can start dominating my friendly zone… and so I move him towards that. Sadly, he’s *just* out of the zone, which means no scoring on Aaron’s turn (it’s still too early to score on my turn, but I highly doubt Aaron would have anything to contest with)… but whatever. Aaron was unhappy about the loss of the majority of his infantry… which I respect. I mean, ARM18 AKs should be a struggle to take off the board… and yet. But we must soldier on! Irusk gives 2 to the Behemoth’s subcortex, upkeeps “Superiority”, and we’re off. Torch goes first, stepping over the fence and trying to flame-thrower a few Zealots… but it’s only RNG6, and so nothing is within range. The Behemoth moves up a bit and opens fire on Blessing of Vengeance. First shot (unboosted) hits, and I trigger “Vision” to keep him safe. Second shot streaks into my character arc node, boosting to hit and damage, and inflicts a hefty 5 points. Fenris activates and charges 2 Errants, and due to a derp on my side, kills 3 (I self-sac the first death to avoid a Berserk attack, but then he kills the 2nd Errant with ease, getting that attack anyway, which he uses to kill the first Errant!). Whoops. Gorman aims and lobs a Blind grenade at a nearby Errant, which misses but scatters directly onto one anyway. Irusk activates. He moves up, takes a shot at an Errant (flies wide), pops his Feat, and casts “Battle Lust” on the remaining AKs. 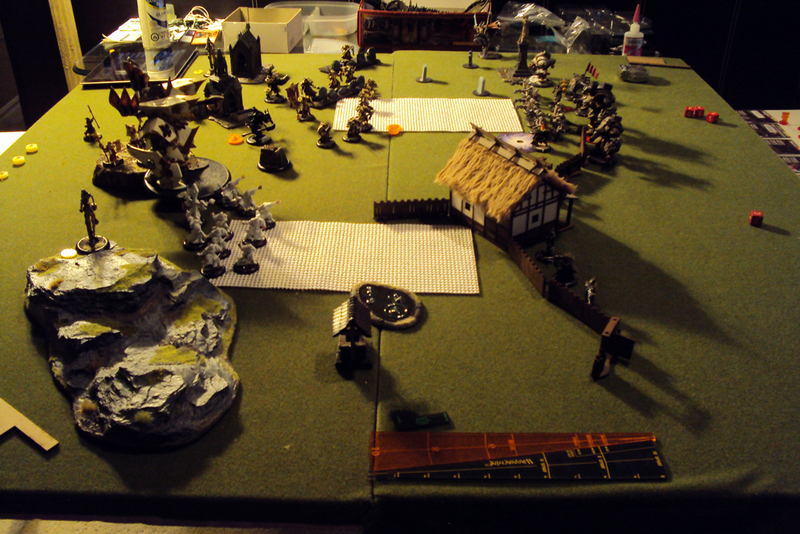 The AKs activate and get “Assault and Battery” orders, opening fire on my Errants and then charging in. When the dust clears, he’s killed 3 of my Errants, including the blind one (ARM18 protecting them from the bullets, and DEF14 protecting them from the charges). Lastly, the Widowmakers activate and walk away from my approaching Zealots. A few take shots at Errants, and one hits and kills. With that, his turn is done! Well, Aaron has his Feat up, which means clearing out those last 4 AKs is going to be difficult… but on the plus side, Irusk is pretty close to the front lines, AND he’s basically abandoned my zone to be dominated by me! So, I’m probably okay… I just have to keep the Judicator away from those heavies until I can inflict enough damage that they’re no longer a threat. 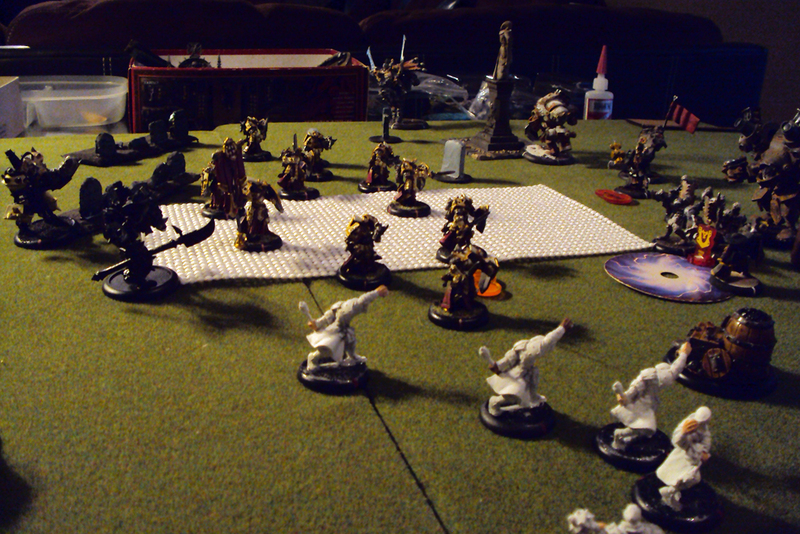 So, Severius upkeeps Eye of Menoth and Defender’s Ward, gives 3 to the Redeemer, and 1 to the Judicator. I want to keep 2 so that I can… well, you’ll see. Hierophant goes first and Harmoniously Exalts Severius. Severius activates and toes into the zone. I make a stumble here (again), forgetting that the Objective is STILL in my CTRL range, which means I can’t dominate until it’s destroyed, but again I want to keep the Eye of Menoth on the majority of my army. 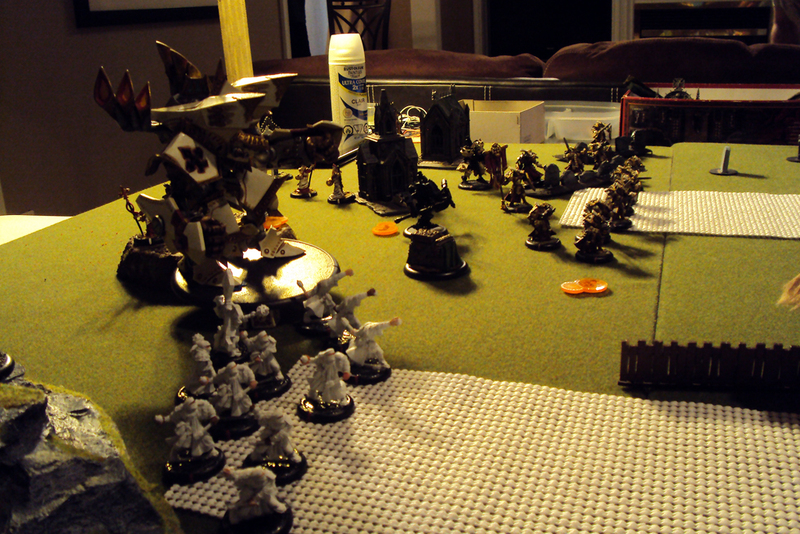 Anyway, he then arcs “Ashes to Ashes” through Blessing of Vengeance onto the closest Assault Kommando. He hits, and it explodes outwards to hit 2 others… but all three make their Tough rolls. Which, as I mentioned earlier, was my cheating… “Ashes to Ashes” is definitely a fire-spell, which the AKs are very immune to. Oops! But no harm done… they all survived, and weren’t Knocked Down to due the Feat as well. Still, I probably would’ve done it anyway… the whole point was to tag Irusk (who I would’ve gotten if I rolled a 4 or more) with a POW12 against his ARM15… but no such luck. 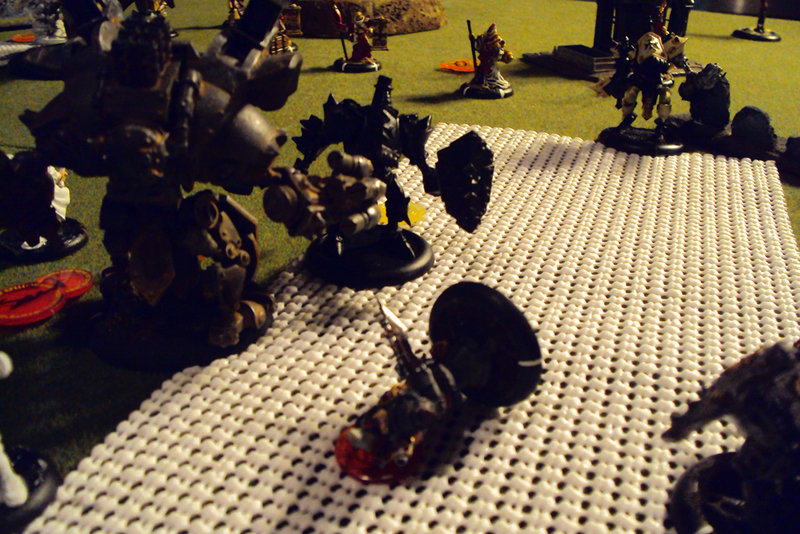 The Redeemer activates and opens fire on Fenris (who’s behind cover, sadly). I boost to hit, and miss… the shot scatters away harmlessly. I buy another attack, boost to hit… and miss, but this time scatters onto Fenris. I roll the damage and inflict 2 (bah). The Zealots activate. They pray for +2 hits and damage, and then move around a bit. I lob some grenades around, pinging Behemoth a few times (hey, POW15s are only dice-6), hitting Torch hard enough to cripple his left arm, and kill 3 of the 4 Widowmakers. The Judicator activates and opens fire on Torch, pounding into the warjack 3 times with its rockets and inflicting heavy damage. The secondary blasts kill Gorman (woo! ), but nothing else. The Errants activate next, charging forward with most getting onto the AKs and the Officer charging Fenris. Fenris is hit and dismounted by the Errant Officer, while the AKs all bite the dust eventually except for 1. I also send a few Quickwork shots at Irusk, none of which find purchase. With that, my turn is done, and sadly I’m still not scoring due to “Priority” rule on Aaron’s objective… but whatever. The game is definitely going in my favour. Aaron is… unhappy. His AKs have been decimated, Torch is on his last legs, Behemoth is taking a pounding (fully operational… for now), and even Irusk is in an unpleasant situation. So he allocates 2 to Behemoth, upkeeps Superiority, and we’re off. Torch goes first. 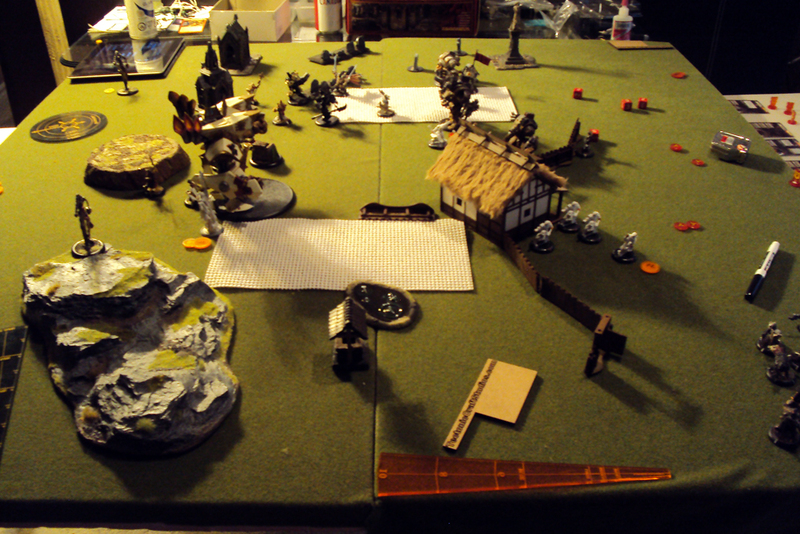 Aaron moves the mighty warjack up to his own objective (surrounded by my Zealots) and swings his Ripsaw at the objective, hitting it and inflicting 10 points of damage between his two melee attacks… he was hoping to destroy it to deny me points, I suspect? 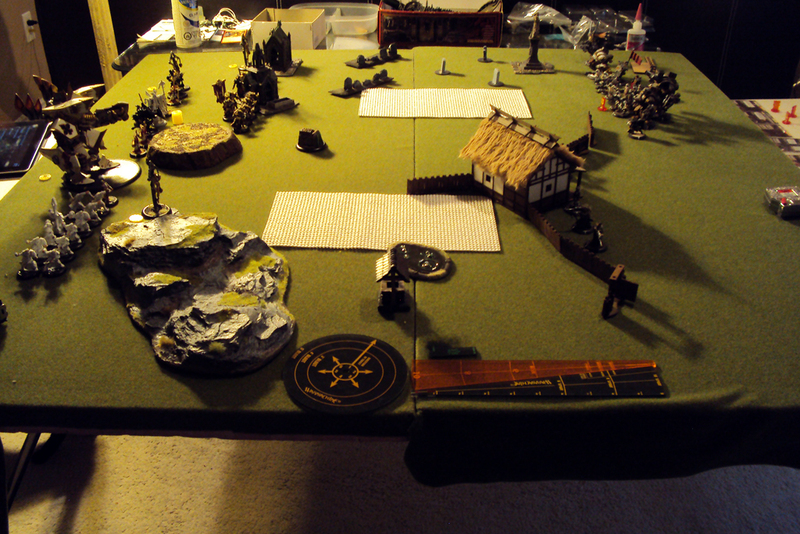 Behemoth moves forward again and opens fire at Blessing… first shot flies wide harmlessly. Second shot hits, Aaron boosts for damage, and inflicts 6 more. The Kovnik activates and gives his Drive to the Destroyer again. He then moves over to a Errant and splatters it. 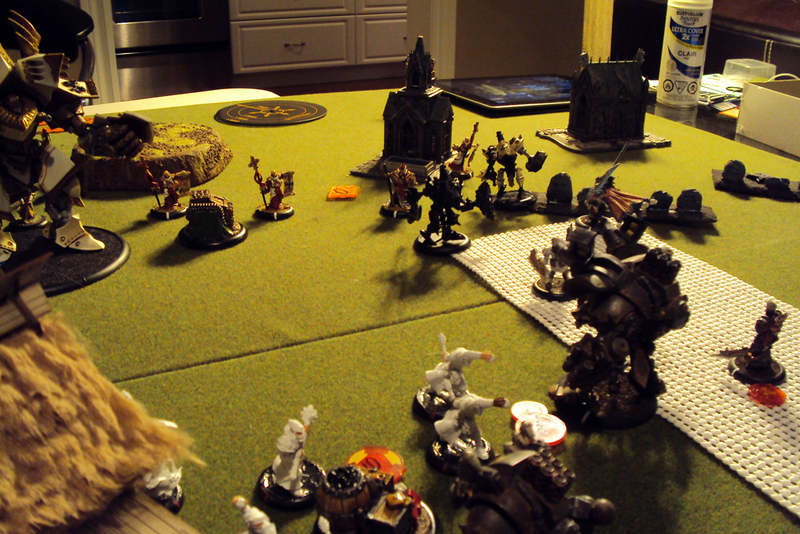 The Destroyer activates and moves up to my Officer engaging Fenris. Two attacks later and my Officer is officially vapourized. Fenris charges my Redeemer. Charge attack hits but only inflicts 3 points of damage, and his second attack misses. Irusk activates and charges an Errant. He hits but fails to kill with his sword… he buys another attack, boosts to hit and damage, and kills the Errant. 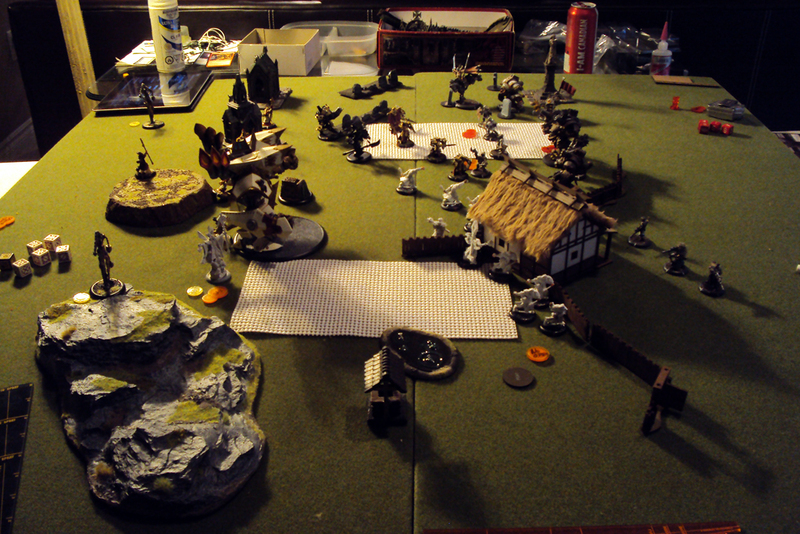 The last AK activates and charges my Errant Standard Bearer, killing him on his second attack. Lastly, the final Widowmaker aims and kills a Zealot. So I’m torn between going for the safer victory (by accumulating Control Points), or just charging and killing Irusk. Heck, no reason not to try both… with the Errants wiped out, there’s only Eye of Menoth to upkeep, which Severius does, and then allocates 2 to the Judicator (giving her a total of 3) and 3 to Blessing of Vengeance, and the last 2 to the Redeemer. The Zealots activate first, with the Monolith Bearer and 2 others getting onto the Objective, 1 dying from a free strike from Torch (just to make sure he’s not engaged), and the rest shuffle around. I kill the last Widowmaker, destroy the Objective, and heap a bunch more damage on Behemoth and Torch (although neither die). I also lob one bomb at Irusk, which sadly misses and scatters away. The Choir activates and sings “Battle” again. The Redeemer shuffles over a little and splatters Fenris (boosting hit and damage). I use a Vassal to give an Ancillary attack to Judicator Dread, who fires at the closest AK and vapourizes him on a direct hit (the secondary shot scatters away harmlessly). Blessing of Vengeance activates and charges Irusk, easily getting distance but sadly moving *just* out of Eye of Menoth range. But the initial attack is boosted to hit and connects, and I crank the damage, dropping Irusk. So that went pretty well! Aaron’s list was probably his own undoing… too many points of expensive warjacks that didn’t get nearly enough work done for their point cost. Also, Irusk really wants to see swarms of infantry for his buffs and his Feat, and a single unit of AKs just doesn’t cut it (although they are probably better with him than they are with anyone else!). I think he’s still suffering from an unwillingness to risk/lose a unit or model in a favourable piece-trade… his Destroyer should’ve been pushing towards my Judicator until I’m forced to deal with it, and then the next warjack should be moving to kill whatever killed that… and so on. By keeping Torch and Behemoth “safe”, he was really just letting me pound them with my POW17 guns. But, hey, what do I know about Khador? Anyway, super-fun game, and I was very happy with how my first excursion with pSevy went. Great little warcaster… not a huge fan of his Feat, but I suppose it could be okay in the right situations. Thanks for reading, and comments, questions, mockery, and compliments are all welcome! This entry was posted in Battle Reports, Irusk, Khador, Menoth, Severius and tagged Batrep, Hordes, IABN, Protectorate, WarMachine by Marx. Bookmark the permalink. Seems like Aaron’s list was a little more Anti-Harbinger than anything. I see what he was going for, I think. There is a lot of potential for anti infantry, backed up with very hard hitting power. If this was a central objective mission, Marc might have been hard pressed to remove that much armour. Only critique I can think of is iron flesh first on the AK’s turn instead of inhospitable ground. Those dice rolls, how?! Two games in a row!!! Yeah, I definitely got lucky when needed… and I’m not saying Aaron’s list is “bad”, per se, just that it’s not optimal. Irusk likes infantry… lots of hard to kill, hard-hitting infantry. Sure, take a unit of AKs, but as the ONLY unit of infantry in the list? Not even a unit of Iron Fang Pikemen? Anyway, what do I know about Khador? It was a fun game, and it was neat to see how it worked out. 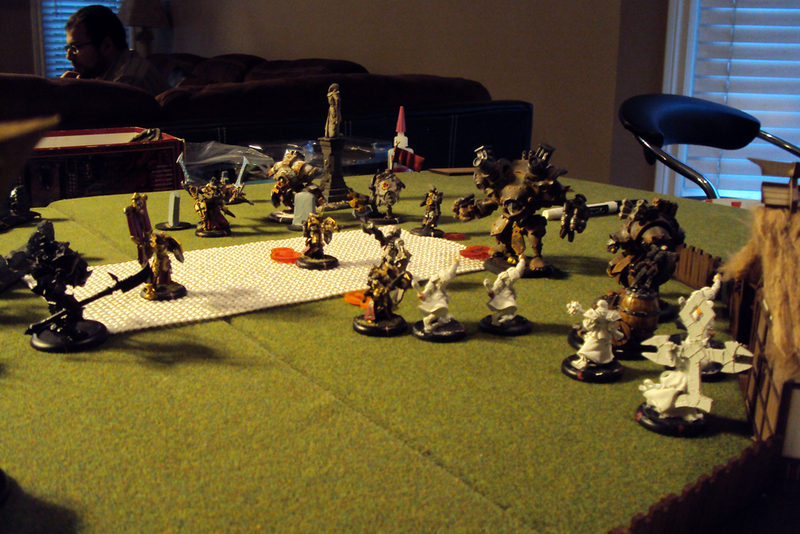 A central objective/zone definitely would’ve been a very different game… my Judicator against THREE Khador heavies? Yeesh!